(Nanowerk News) Everyday cosmetic and cleaning products contain huge quantities of plastic particles, which are released to the environment and could be harmful to marine life, according to a new study. 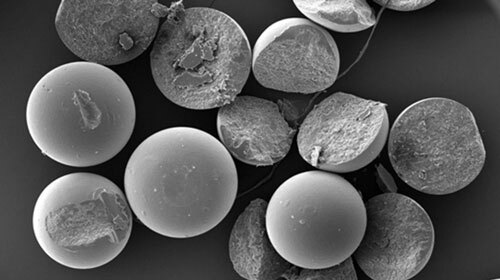 Research at Plymouth University has shown almost 100,000 tiny 'microbeads' - each a fraction of a millimetre in diameter - could be released in every single application of certain products, such as facial scrubs. The particles are incorporated as bulking agents and abrasives, and because of their small size it is expected many will not be intercepted by conventional sewage treatment, and are so released into rivers and oceans. Researchers, writing in Marine Pollution Bulletin ("Characterisation, quantity and sorptive properties of microplastics extracted from cosmetics"), estimate this could result in up to 80 tonnes of unnecessary microplastic waste entering the sea every year from use of these cosmetics in the UK alone. The latest study was led by PhD student Imogen Napper, together with Professor of Marine Biology Richard Thompson, Professor of Organic Geochemistry Steve Rowland and Postdoctoral Researcher of Analytical Chemistry, Dr Adil Bakir. Imogen said: "As the study unfolded I was really shocked to see the quantity of microplastics apparent in these everyday cosmetics. Currently, there are reported to be 80 facial scrubs in the UK market which contain plastic material, however some companies have indicated they will voluntarily phase them out from their products. In the meantime, there is very little the consumer can do to prevent this source of pollution." Microplastics have been used to replace natural exfoliating materials in cosmetics and have been reported in a variety of products such as hand cleansers, soaps, toothpaste, shaving foam, bubble bath, sunscreen and shampoo. There is growing evidence that the amount of plastics in marine waters is increasing, with around 700 species of marine organism being reported to encounter marine debris in the natural environment, and plastic debris accounts for over 90 per cent of these encounters. For this study, researchers chose brands of facial scrubs which listed plastics among their ingredients, and these were subjected to vacuum filtration to obtain the plastic particles. Subsequent analysis using electron microscopy showed that each 150ml of the products could contain between 137,000 and 2.8 million microparticles. Professor Richard Thompson, who has been studying the effects of litter in the marine environment for over 20 years, said: "Using these products leads to unnecessary contamination of the oceans with millions of microplastic particles. There is considerable concern about the accumulation of microplastics in the environment; our previous work has shown microplastics can be ingested by fish and shellfish and there is evidence from laboratory studies of adverse effects on marine organisms."